Long story short? Inbound marketing lets customers find you, not the other way around. Using an inbound marketing strategy prevents marketing and sales teams from spending a lot of their already busy days trying to source new leads, which may or may not turn into customers. It focuses marketing efforts on helping potential customers, solving their problems, answering their questions and making them feel valued. It also results in a greater number of qualified leads coming through on their own, as opposed to having the sales team chase potential leads down. Read on to find out more about inbound marketing and how you can use it to grow your business. Inbound marketing has been around for a while, but it is constantly changing and evolving as user behavior changes and technology advances. Inbound is a strategy that allows potential customers to find your company and (when they’re ready) to make a purchase. Recently HubSpot, the creator of the Inbound Marketing Methodology, re-defined the stages of Inbound from four stages into three. The three stages of the Inbound Marketing Methodology are: attract, engage and delight. Essentially, inbound marketing involves creating content that draws in your target audience, nurturing those leads into sales and then continuing to stay in touch, hopefully leading to repeat business. 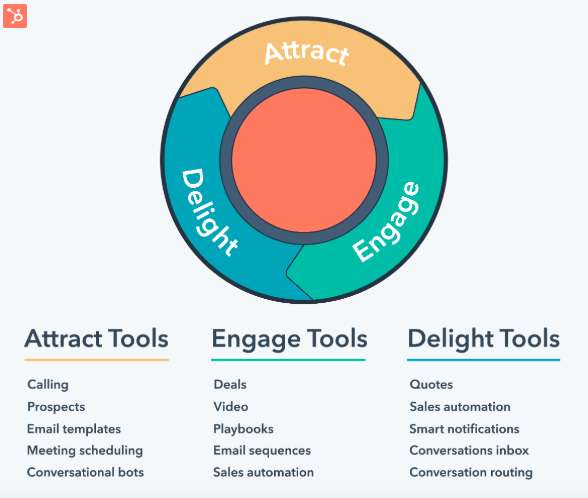 HubSpot has a great infographic that illustrates the three stages and what tools work best for each stage. Here is a bit more about each of the these stages of inbound marketing and how you can use them in a practical sense. In the first stage of inbound marketing, you will work to attract your ideal customers and bring them to your web site. You can do this using tools like SEO, paid advertising, video content, blog posts and social media posts. The idea is to entice customers so that they will be interested in finding out more about your company. The trick is to provide the answers to questions they may be searching for. Draw them in with content that is relatable and relevant to their experience. If your company has a solution to their problems, they are more likely to become customers. This stage involves creating conversations that lead to lasting relationships. When consumers visit your site, you can use conversion tools to capture contact information and learn about their preferences. This information will help you customize their experience on your website with smart data, making them feel more engaged and creating a sense of admiration or affection towards your brand. You can also use this information to keep in touch with customers via email to let them know about new blog content, sales, specials and new products they may be interested in. Continue to nurture these leads until they are ready to convert into customers. In this stage of inbound marketing, you will continue to provide your customers with engaging content in the hopes of keeping up a long term relationship. This is the perfect time to ensure customer satisfaction and loyalty. Utilize your content strategy and marketing automation software to stay in touch with your customers, and make sure they feel appreciated. The bottom line? Delight them with your content and customer service! This will ensure that they continue to do business with you. They may even be inspired to share your content and promote your business to family and friends. To gain a comprehensive understanding of inbound marketing, it is important to understand outbound marketing, as well. Unlike inbound marketing (which draws customers IN), outbound marketing serves to push messages OUT. Tactics of outbound marketing include cold calling, trade shows, seminars and email blasts to purchased lists. When using outbound marketing, the hope is that these methods will work to resonate with consumers. However, they can have more of a needle-in-the-haystack effect, resulting in low ROI and making for an overall costly and time-consuming tactic. As time goes on, customers are becoming savvier to spam, which is often associated with outbound marketing. They are also more likely to use the internet to shop around, so trade shows and seminars are waning somewhat in popularity. These new trends are phasing out the traditional outbound marketing method as inbound becomes a favorite in the digital world. If you are trying to market your products, inbound marketing is an effective way to draw customers in and grow your business. Work on creating content that will engage consumers, right down to the point where their interest leads to conversions and continued loyalty to your brand. Interested in transitioning to an inbound marketing strategy? Reach out to the marketing experts at Ironmark to start using this method to help increase your customer base and your bottom line.